The truth about the most popular refrigerators coming from some of the major appliance brands is that majority of the brands offer almost identical products in this category. The new models available in the recent times tend to be more energy-efficient in comparison to the ones produced even five years ago. So, how do you make the choice of the best refrigerators in 2019? The very first thing that you will have to do is measure the space availability in your home. Once you are done with this, it is time for you to figure out the style and the size of the refrigerator that can best suit your lifestyle. Getting hold of the best refrigerators in 2019 is something very personal. There are some people who like going for products with top freezers as they fit into small spaces very well. However, there are others items with bottom freezers might be the right choice. This is because such refrigerators do not have the users bending down frequently to reach the fruit and vegetable drawers. Then there are others who prefer side by side models that are larger than the normal models. These products take up a lot of space in the kitchen while offering ample space for food storage. If you are completely confused and do not know where to start, try checking out the list of best refrigerators in 2019 provided below. You will find the details of the best models and this will further help you in coming up with the right decision. This is the best overall refrigerator in 2019. It is an attractive and modern selection for all kitchens. The model features high gloss, stainless steel slate and black doors with gray case finishing. It is virtually a product to go with almost any kitchen décor and style. The item also features a water dispenser and an ice maker for the convenience of the users. The freezer and the fridge come with the potential of storing around 26 bags of essentials and groceries. A large or a small family can easily and comfortably make use of this model without going through any difficulty. One of the most impressive features of this product is its side by side door design that is great for spacious and wide kitchens. The ice and water features might scare off the first-time users at the first glance but they are highly convenient. The dispensers in this product are wide and tall to fit large mugs and cups. The dispensers also boast of highly advanced water filtration mechanism ensuring that the users consume only best quality water. The dispenser removes trace pharmaceuticals in the most professional manner. Summing up all the features of the GE Side by Side Refrigerator, it can rightly be said that it is one of the best refrigerators in 2019. If you are in the look out of a small and compact apartment-friendly refrigerator then the double drawer model from KitchenAid would be the best bet for you. As is known to every individual, apartments offer a challenging area in terms of organizing equipment and furniture. The space offered in an apartment is smaller than typical home layouts. However, this does not necessarily mean that you will have to settle for minuscule furniture pieces and appliances. The best way of using an apartment function and form is by maximizing the available space. Therefore, it makes sense to go for the apartment friendly KitchenAid Double Drawer Refrigerator that offers some strategic space for usage. This is a model that takes a completely different approach to storing food and other essentials. It is compact and small but maximizes the space that you can actually use. It features two distinct drawers while offering an internal space of 4.7 cubic feet. Food in the product can easily be accessed from the top. The contents can even be placed at the edges which means that there is no space wasted. You will even find an in-built ice maker in this product. The LG Door-in-Door Refrigerator features a panel that is made of sleek mirrored glass and is illuminated with two quick knocks. This allows the users to get a clear view of all the items stored inside the fridge. There is easy access of the compartments offered to the users and that too without having to open the door. This is a technology that helps in reducing the loss of cold air which further helps in keeping food fresh for a very long time. there is even an innovative transparent window that enables the users to check all the items that are stored inside the fridge without having to open the door. With the Instaview Door-in-Door Refrigerator from LG, there is absolutely no need for you to open the door of the product to see what’s inside. It is one of the best refrigerators in 2019 specifically meant for tech savvy individuals who like to use appliances that make their lives more fruitful and efficient. This model from LG is a high-tech refrigerator that can make keeping track of stored supplies and food in the kitchen a breeze for the homemakers. This smart refrigerator even connects to the internet for helping the users keep track of all contents inside. The model also features the Smart ThinQ technology that is proprietary to LG. the use of this technology helps users in accessing its smart functions through an app for controlling varied settings and for monitoring the contents inside. The Samsung Food Showcase French Door Refrigerator is probably the best showcase refrigerator. It is one of the best products that you can use for sprucing up the interior style of your cooking space. It is one appliance that adds to the overall design of your kitchen. And it defines the overall appearance of the space while adding good style with its exclusive double drawer/double door design. Its upper compartment works in the form of a normal fridge on both sides. It also features a two-in-one door design for viewing the contents inside through inner glass. There are two drawers at the bottom that offer freezer space. it is only because of the maximum use of space that is offered by this model that it is counted as one of the best refrigerators in 2019. French door design helps in maximizing access to both sides of a refrigerator. The traditional fridge models, specifically the ones with the freezer and the fridge stacked on top of another, made it very difficult for the users to get hold of the things they kept inside. However, by incorporating a side-by-side, French door style refrigerator in your kitchen, you get easy access to the horizontal and vertical space the product has to provide in all its compartments. This refrigerator model from LG comes with a classic split-door that features two lower drawers that offer additional organization. There is an upper compartment that offers continued space between both the doors. This means that you can use the entire storage up. Down, there are these Easy Reach Bins and even chiller drawer that give you the flexibility of storing daily snacks and frozen foods separated from the other items and drinks. This way your entire organization is neat and tidy and is in no ways messed up. If there’s one complain about the regular refrigerators, it is the lack of proper style and function. Fortunately, not all fridge models come with the same old designs. For the ones who are in the look out of something that tends to be more pleasing and aesthetically appealing in the kitchen, a stylish refrigerator is the way to go. Daewoo Retro Compact Fridge is one such stylish refrigerator that will surely throw you back to the retro era of appliance designs. This model is the perfect choice for you if you want a hint of compact and retro accent in your kitchen. Available in the size of a typical fridge, this is one product that offers sufficient space for a few meals worth of drinks and food. it is a portable refrigerator with its exteriors made of good quality metal and stylized with retro, sleek lines. One of the best things about this item is that it can be cleaned very easily. Another noteworthy feature of this product is that it is highly durable. It comes with the potential of offering continued service for several years. If you want something compact for your kitchen then the Magic Chef Mini Refrigerator would be the right choice for you. Often termed as “mini fridge”, this is a compact model that serves as one of the best choices for individuals with small spaces. Irrespective of the fact that whether you are living in a completely cramped apartment or you simply want something for your individual room, this compact refrigerator allows you to store drinks and food in small amounts whenever required. It is also great when used in the form of a secondary fridge for homeowners who need a little bit of extra cooling space. The product keeps things very simple by offering an interior space of 2.6 cubic feet. It features a couple of easy to clean shelves made of glass for dividing the contents inside. This is a model that maximizes power savings because of its small size. It does not use a lot of energy when it comes to cooling food and beverages. There is adjustable thermostat that can be used for controlling temperature. 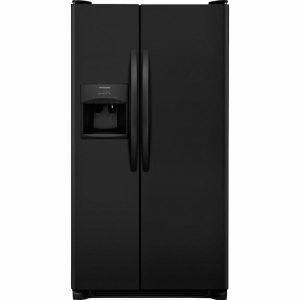 The Samsung RF23M8590SG Refrigerator is the top pick in the list of the best refrigerators 2019 mainly because of its luxury usage and its four-door French door design. This product features an impressive 21.5 inch touch screen. It is a premium refrigerator featuring the latest in energy-saving and smart home technologies. The model can be described as one of the most efficient refrigerators presently available in the market. It is an innovative and elite appliance that maximizes efficiency and energy saving. Additionally, it features a control panel that can easily be read along with a thermostat. The touch screen of this appliance works with the mobile applications of Samsung which means that videos, slideshows and calendars can easily be synced with the fridge display. 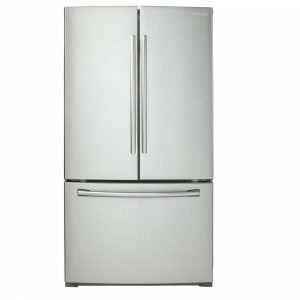 If you are in the look out of the best budget refrigerator in 2019 then the Frigidaire Side by Side Refrigerator would serve as the best option for you. 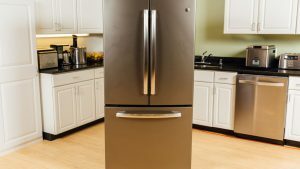 The fridge models from Frigidaire are known for their durability and even this model lives up to the expectations of the users while being more affordable than the other best refrigerators in 2019. It has two shelving units inside that can easily be adjusted and they are made of good quality glass. The product also features two drawers with varied humidity controls offering complete flexibility in storing food and beverages. This spacious and highly economical refrigerator is the one that you must get if you are limited on your kitchen appliance buying budget. This is a product in exclusive design and you must definitely get it if you want to impress the guests to your home. It comes with an external refrigerated drawer along with other fun features that have made it easy to make it to the list of the best refrigerators in 2019.